Rik's Ramblings: How's your 401(k) doing? 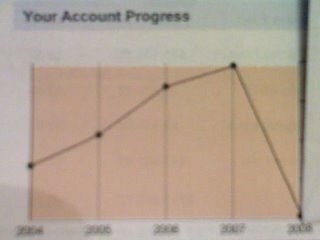 Incase you can't read it the bottom axis is years from 2004 to 2008 (end). The vertical is a little misleading in scale, but 'worth 75% of it's 2004 value' just about sums it up. Geeze, I hope the fund 'manager' doesn't get his pay slashed to a meagre $500000 by Pres. Obama!